Despite the 8 per cent fee hike cap under the Punjab Regulation of Fee of Unaided Educational Institutions Act, 2016, private schools in Chandigarh have increased their fee by more than double the limit — up to 19 per cent. 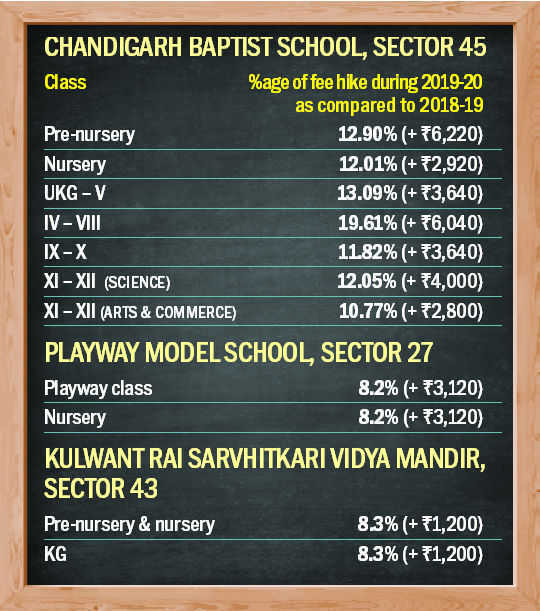 Information on fee hike by private schools gathered by The Tribune revealed that of the 66 schools, three schools – Chandigarh Baptist School, Sector 45, Playway Model School, Sector 27, and Kulwant Rai Sarvhitkari Vidya Mandir, Sector 43, have increased the fee by more than 8 per cent. As many as 11 private schools have not submitted the comparative fee hike information sought by the Education Department. The Ministry of Home Affairs issued a notification on April 13, 2018, regarding the applicability of the Punjab Regulation of Fee of Unaided Educational Institutions Act, 2016, to the Union Territory of Chandigarh. As per the Act, the increase in fee should not exceed 8 per cent of the fee of the previous year charged by an unaided educational institution. As compared to the fee in the previous academic session 2018-2019, Chandigarh Baptist School, Sector 45, has increased the fee for all classes in the current session regardless of the fee cap. The worst hit are students of classes IV to VIII, who have witnessed an increase of Rs 6,000. From Rs 30,800 in the last session, the fee has been increased to Rs 36,840 (19.61 per cent). For the pre-nursery class, the fee has been increased from Rs 48,220 to Rs 54,440, resulting in a hike of 12.90 per cent. Similarly, there is an increase of 12.01 per cent for UKG to Class V and 11.82 per cent increase for Class IX and X. However, the school did increase the fee by more than 8 per cent for Class I to V in the previous session as well. There was an increase of 8.59 per cent last year as against the Principal’s claim of 4 per cent hike in previous years. Playway Model School, Sector 27, has increased the fee by 8.2 per cent, whereas Kulwant Rai Sarvhitkari Vidya Mandir, Sector 43, has increased the fee by 8.3 per cent for 2019-2020. If any unaided educational institution contravenes provisions of the Act, it is punishable with a fine, which may extend up to Rs 30,000 in case of unaided educational institutions of the primary level and Rs 50,000 in case of the middle level and up to Rs 1 lakh in case of the secondary and senior secondary-level institutions for each contravention.